[Scale] What does “early-stage” really mean? What is Seed, SeriesA, Early-Stage? Have you ever heard about pre-Seed or pre-A? Actually, that’s the most discussed topic in the startup ecosystem. VCs are trying to differentiate themselves by answering the question “which stage are you investing in ?” and startups leveraging it as a PR material. Usually, people expect figures as an answer, but it varies a lot from a country to another one and across industries. So let’s share how we see these stages at astorya.vc, and define them in another way: based on where the startup is in its growth journey. 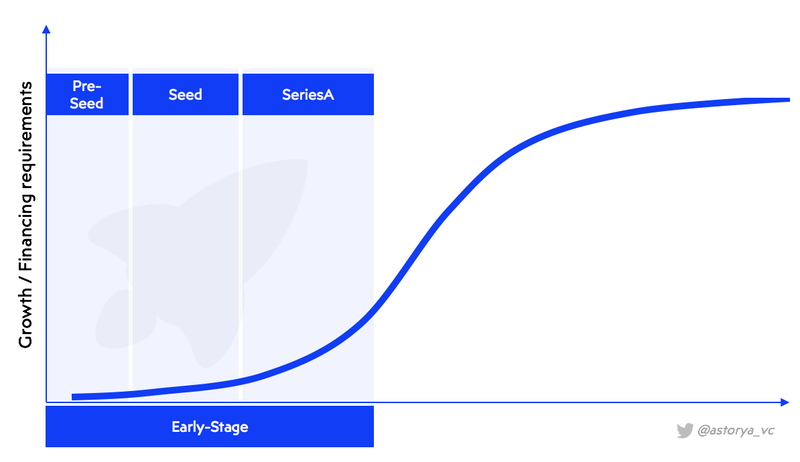 Here, we will focus on early-stage startups and split that part of the market into 3 stages (or phases): pre-Seed, Seed, SeriesA. Pre-Seed could be basically defined as a team with an idea. The investment thesis is mainly focused on people and their capacity to build a product/service they can sell, starting from almost nothing. Investment range would usually be 100–300k€ to build the first product (usually at MVP stage), pay admin expenses (registration, office, software tools, etc.) and hire first team members. Beyond money, investors should mainly support the team on product design and HR. Investors should as well pave the way to the first institutional round of funding (BP, deck, etc.). Seed could be defined as a team with a product (even at MVP stage). The investment thesis still strongly relies on people but the product should be a competitive advantage. And even with small or no revenues, the challenge is to identify the first customers by adapting the product accordingly. Building and deploying the product among early customers is key to reach the product/market fit and then demonstrate the company could scale. Investment range would usually be 300k€-3m€ to build a team. The first focus will be around tech and product to improve the offer according to feedbacks from first customers and ease implementation. On top of that, B2B startups will mainly focus on the sales process that might be up to 12–18 months long, B2C startups will spend on marketing to attract their first users. Beyond money, investors should support the team on HR, product management and building a sales process (sales material, pipeline, …) to show a traction and of course a capacity to execute. SeriesA could be defined as a team with a product generating revenues that shows a product-market fit. The company should have a view on its unit economics (Cost of Acquisition, LifeTime Value, sale cycle, …) to prove there is a clear path to grow. The investment thesis — though still related to the team — is on the capacity to scale by industrializing the sales process. The product still needs new features but the key focus is on selling a product “on shelves” and have standardized processes to integrate solutions among customers. Investment range would usually be 3–10m€ to grow significantly the team and structure it by introducing a level of management (e.g. in the sales team). The organization should show a capacity to replicate what has been delivered on first customers at a bigger scale. Beyond money, investors should mainly support HR to find many new talents. Experience and best practices are key to structure the team around processes to industrialize growth. And business development capacities should support entrepreneurs to accelerate sales. At astorya.vc we usually say we are investing in early-stage startups. Long story short: we mean post product, so we are doing ‘Seed’ as defined above. And of course we stay focus on insurance-related startups all over Europe.